Practical Home Planning for the Twenty-First Century--Condensed Edition Available now online and in print. 202 Pages, with dozens of photographs and drawings. This condensed edition doesn't beat around the bush. It gets right to the point in clear, concise language for quick reading. Not a lot of pictures. All black and white pictures and drawings to minimize reading time. 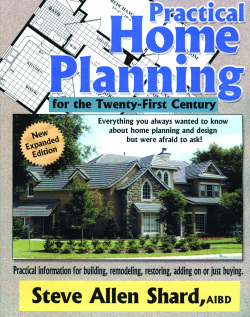 Practical Home Planning for the Twenty-First Century--New Expanded Edition Available now online and in print. 228 Pages, with more than 250 photographs, drawings and diagrams, many in brilliant full color. This expanded edition features expanded information in each chapter, many color and black-and-white photos, drawings and diagrams, a glossary and more questions and answers. This is really exciting reading for anyone who is contemplating building a new home, adding onto or remodeling an existing home or restoring a historic relic. Even if you're just looking to buy an existing home, this book has much information for you to make an informed decision. Home styles are researched, listed and photographed for easy reference. If you've read the Condensed Edition and want more, this book is it.